Add a dynamic, selective songbird feeder to your garden with the Gardman Mealworm Feeding Tray. This versatile feeder offers an array of food to your birds in the base tray, while the clear plastic dome protects it from undesirable birds and the elements. The square, black metal feeding tray holds 0.6 quarts of dried mealworms, seed, fruit, or virtually any other type of feed, and its micro-mesh design allows water to drain, keeping feed dry and fresh. A square dome sits above the tray, with a flared lip to direct precipitation away from seed. This dome may be raised or lowered along the center support rod, adjusting the distance between the tray and dome. This limits access to seed for larger birds or undesirable visitors. 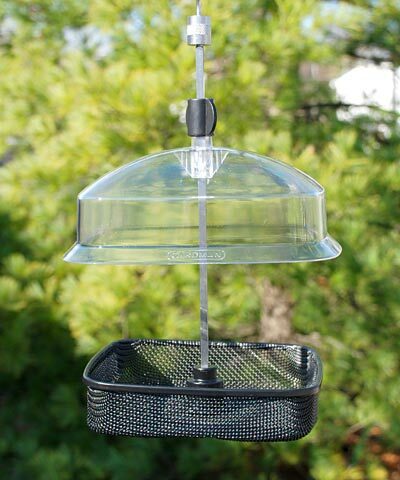 The clear plastic dome allows you to monitor avian activity, and a wing nut keeps it in place on the metal rod. The included hanger offers a way to hang the item on a hook or branch, or it may be pole mounted with a threaded adapter (not included) if desired. Offer select songbirds a wealth of feed in this Mealworm Feeding Tray. Capacity: 0.6 qts., 0.9 lbs.